2018 ended on a humbling note for me in some important ways, including a couple of screw-ups on my part. Nothing earth-shattering or life-threatening, just lesson-inducing. I’m sharing the most recent screw-up—and the learning it recalled—because, as usual, I think we can all benefit. The screw-up: I got triggered by a question that someone (innocently) asked me via email and indulged in my reactive state by sending a lengthy and negative reply. What’s worse, it was relatively late in the evening and I prefaced it with, “I don’t really have the bandwidth to talk about this right now” … yet I continued on. I next admitted to being triggered in a self-congratulatory way (‘Look how insightful I am!’) And then I proceeded to dump all over her in writing. Class act LOL. The immediate result: I realized pretty quickly that my higher self wasn’t at the wheel. I kinda knew it all along—in fact, I’d been dealing with some low-level life tension for a couple of months. I just didn’t take the time to do anything about it until it became clear I had caused some pretty hurt feelings with my email. We eventually worked through it, and not surprisingly I think our relationship will be stronger for it. Though of course I always prefer to be a role model rather than a cautionary tale. While I’m working on restoring my own good perspective-keeping practices (like exercise, acupuncture, and time in the art studio), I can also remember to employ the 24-hour rule—i.e. wait 24 hours before hitting “send” (literally or figuratively) on any communication where there’s any kind of charge. Charlie taught me that one, and I think it’s a great life practice. If you don’t have 24 hours, then wait as long as you can. Draft the message, sure. Do what you have to do to vent/process/express away from the relationship at hand, as long as that doesn’t draw others into it in a dysfunctional or inappropriate way. In other words, do your self-work. Then revisit and respond. The upside: I was sufficiently embarrassed by my do-as-I-say-not-as-I-do moment that (1) I got into action quickly to reinstate my own S-lowering life practices, and (2) I’m totally committed to it not happening again, with this person or anyone else. That is, at least not until it’s time for this particular life lesson to circle back around (since they often work like that). 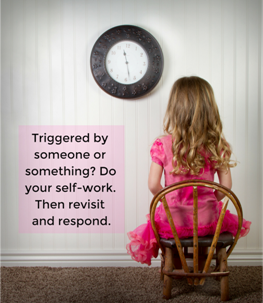 This week, take inventory of the strategies you regularly use when you’re triggered by something or someone. Which ones are effective and which ones are not? 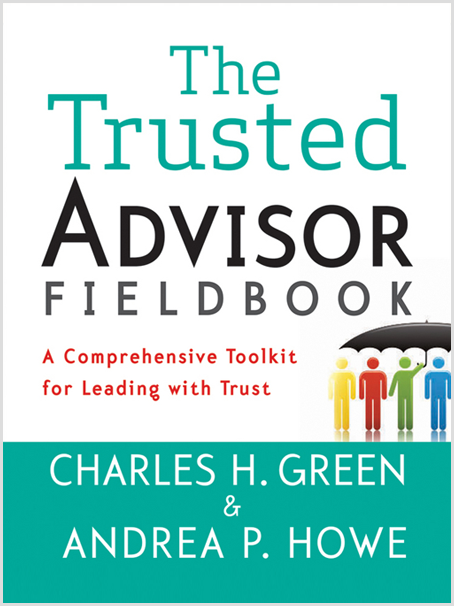 Watch a trust tip video on managing blame and responsibility, from our friends at Trusted Advisor Associates, or brush up on ways to look inward in Chapter 10 of The Trusted Advisor Fieldbook.